We believe that people are the center of the organizations, and that each one can make a difference. Smart Solutions in a Cloud Ecosystem, with multiple advantages. Integrate all your processes associated with people management according to your needs and indicators. Manage your processes and functions in an easy and simple way to achieve business objectives. Collaboration between teams, to achieve the correct and efficient functioning of the organization. We support decision making in organizations, through modular solutions that allow centralizing and automating all processes associated with human resources, reducing administrative work and delivering relevant insights for the business. HCMFront is based on cutting-edge technology. 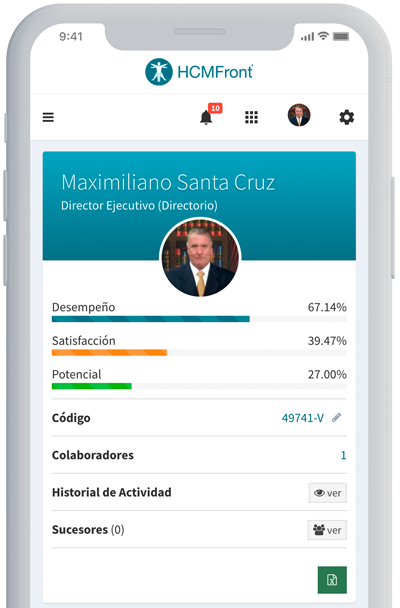 With a user-friendly design, data analysis and machine learning processes, it allows Human Resources, managers and anyone in the organization to always manage the relevant information for the management of their teams. A collaborative intelligence network for the generation of best practices linked to business performance. We optimize People Management through reliable, scalable and interconnected SaaS solutions to generate effective results for the business. Collection, order and storage of data. Simpler administrative personnel processes. Easily manage the Performance and Evaluation Management processes, from setting the objectives, competences, to reports and agreements. A simple and intuitive system to handle all your talent research processes. 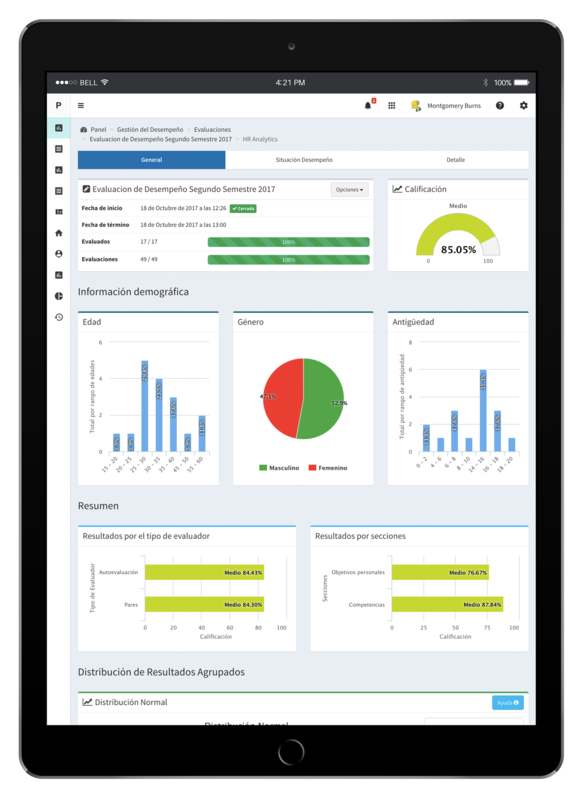 The dashboard and the report of each module gives relevant insights for the business according to the organization goals. We validate your knowledge and skills in HCMFront tools and modules application. Fusion with the organizations own systems for better data and information collection. In all instances and stages of our service, worked and designed by experts. For us, as Explora, working with HCMFront has been a really good experience, it's a dynamic platform, easy to use for the candidates postulating and for the company users, allowing us to take real control in the progress of every process. Besides, it's designed to be used in any kind of device, which helps a lot in terms of accessibility. At last, I want to mention that as a team they provide a really good service, advising the candidates in their postulations whenever they need, and us in a better use of the platform, as well in the development of requested adjustments. As a user, the experience has been very positive. The system is very friendly to carry on the different processes of the area, and the dashboards reports allow us to see the different scenarios saving a lot of time. Additionally, HCMFront gives a very good after-sales service and I believe that is unpayable compared to other organizations. I recommend HCMFront, of all the programs I've seen this is the one that has most associated with me. We worked with HCMFront for the implementation of the climate thermometer in 2016. The support was constant prior to the assessment, during and after for the analysis of the information. We were able to customize the software according to our needs, both in the content and in the parameterization of the results and in the graphic insights. They were available to answer our doubts, showing a personalized service and being 100% available in the project. It was a pleasure working with them and now we are evaluating to buy other modules of the software. 100% Recommended. Different looks allow you to create something unique. We work in effective interdisciplinary teams. Based on evidence we innovate and continuously improve. The customer is our focus. We want our work to have a positive impact on him. We identify problems, we look for solutions and we risk, we learn fast to always advance. We value everyone´s success, share time ans know-how, we listen and learn from others, in an open and genuine attitude. What happens when I create a Free Trial Register? You will be creating an account on the HCMFront site, and you will receive a password to your email. With that password you can enter the system to know the services we offer for a 14 day period, without associated costs. By creating that account you will be accepting our terms and conditions and private policy. When your free trial is finished, your user and password are desactivated. If you want to reactivate your subscription please write us to contacto@hcmfront.com. What is our products and services Pricing? Our products and services have different prices, depending on various factors such as the number of employees, number of modules and their versions. They also can depend on the discounts according to the chosen plans. Moreover, our products and services can be hired individually os in packages. Can I make my subscription online? It's not possible yet, we are working on it. At the moment you can create your account and an executive will contact you. Will my data be secure on the platform? Always. Our system is 100% cloud and the data is protected. Our provider, Amazon Web Services, guarantees the security of our information. Ready to start using your Free Trial? Sign up and get to know the HCMFront experience. Enjoy our platform and discover how to make your processes more efficient. Latest news and trends in Human Resources, People Analytics and Digital Transformation.